Show-off your dog's special ability with his own hunting dogtags. You may also be interested in our guncase ID Tag. Customize to Buy your Hunting Dog Dogtags now! 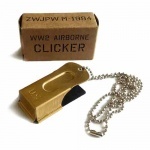 Make your pet the neighborhood Alpha-dog with a military grade dog ID tag! Dog name tags can dangle from the collar or be flush-mounted with 2 rivets directly on to it. 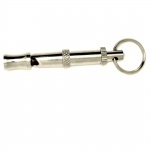 Not just for dogs, these ID tags are also ideal for labelling your dog's cage or travel carrier. For smaller dogs and other pets we offer a Mini Dog Tag, which is ¾ of the size of our regular tags. Other domestic animals need I.D. too! Any animal that has a chance of escaping its home should have an identification tag... cats, rabbits, horse halters, llamas, goats, even ferrets! 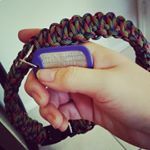 Dogtags are also ideal for attaching to your pet's cage or kennel! 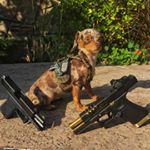 Don't Use Silencers with Pet Tags! We recommend that you do NOT order silencers if the dogtags will be used on your pet. The silicone rubber will eventually wear down over time and may tear, this is especially likely when used on a dog's collar as they are exposed to much more wear and tear. Furthermore, your pet may try to chew off and eat the silencer which may pose a health hazard. If you REALLY want a colored silencer for your pet's tag, please choose a latex rubber silencer. They are more durable and will last longer, but they too will eventually wear out. All orders are shipped within 1 business day and are usually delivered within 1 week (in North America). 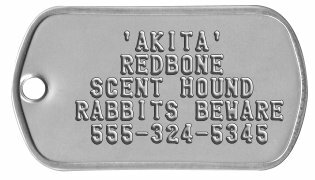 If you need any assistance creating or ordering your Hunting Dog Dogtags please contact us directly, we are here to help!